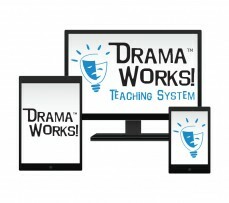 Individuals or groups can receive training and guidance directly from the author and creator of the Drama Works! Teaching System from anywhere in the world. Video conferencing sessions include Q&A, hands-on activities, and virtual presentations with share screen technology. 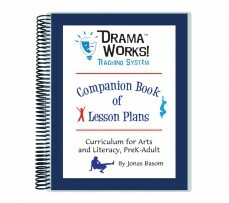 Learn invaluable teaching strategies including classroom management, arts integration methods, curriculum planning, assessment, and alignment to state and national content standards in arts and literacy. Discover new ways to enliven your teaching and overcome challenges in your classroom. 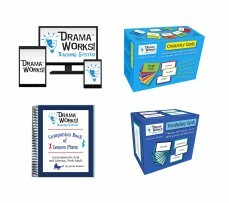 Gain new knowledge of how to do more with the Drama Works! Teaching System digital and print resources. Preferred method of connection is Skype or Google Hangouts, but others can be arranged. From the drop down menu above, select either one hour (minimum) or 1 1/2 hours and then change the quantity to get the total amount of time you wish to purchase. Your total time can be scheduled for one continuous session or split into multiple sessions (minimum 1 hour per session). Purchase the number of hours you want, then Contact us to arrange scheduling. Video conferencing sessions are one of our Staff Development and teacher training services. Schools, districts, and organizations can Contact us for free assistance and advice putting together a package of training services and curriculum materials to provide ongoing support to your staff.